Tomorrow see's the release of our latest parody tee, that being 'CASUAL CONUTS'. Yeah it's a bit crazy but aren't we all? It works and that's dandy with us. It comes on White and Natural tees - online Weds at 7pm GMT. So go nuts. 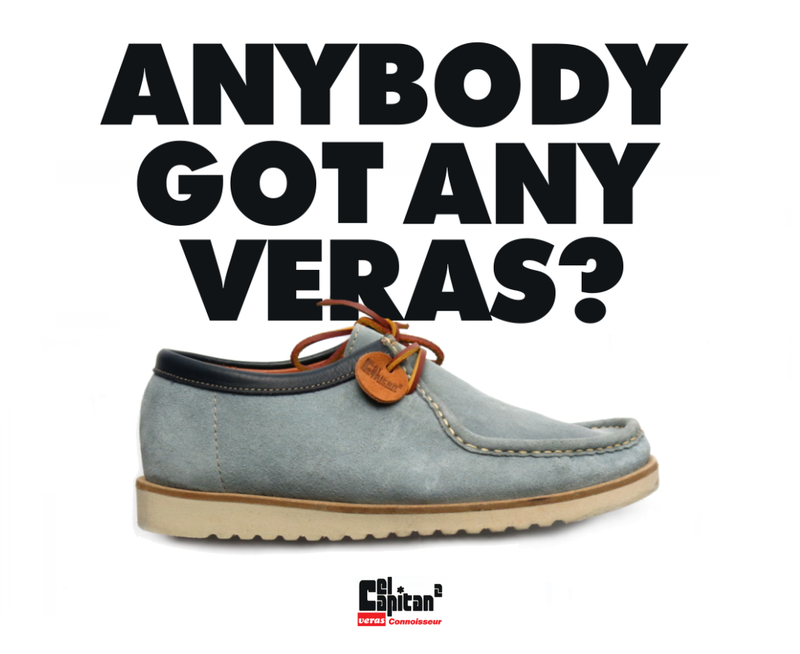 CONNOISSEUR x VERAS - EL CAPITAN II. What do you get when you cross Spain with Wales and England? more dead nice shoes! 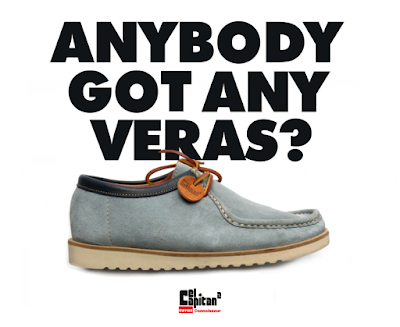 The El Capitan II shoe is a superb new collaboration with Veras shoes. A premium suede upper on a super light EVA sole, making these very light and comfy. Whilst most suede shoes come in the usual sensible tones of Browns and Beige, our first installment of this new and improved model comes in some daring colours - Acid Green, Ice Blue and Orange, something we've always wanted to buy, but seldom see ourselves. With contrast leather trims and leather laces, suede swing tag and dual branded stamped insole, branding is kept subtle. A slightly familiar 'silhouette' (based on an old Connoisseur favourite) is the basis of the upper, whilst the light EVA sole unit on a Salpa welt gives this shoe it's own style. With a clear 1990's acid casual influence going on. Made in a long established footwear factory in Spain these are produced just for us in a one-off run in smaller numbers. Tomorrow at 7pm see's the release of our two new products produced with Ebbets Field Flannels. We have a baseball cap and if you know Ebbets then you'll know they are the best at the baseball cap game which is why weve got them to produce another one this year. And we've done a vintage style coach jacket/windbreaker with the alternative Two C branded trademark on the front. This years cap is a navy wool 6 panel pinstripe cap, plain peak of course, featuring contrast top button and full skull logo embroidery on the front. Comes with the usual tremendous Ebbets details including the inside detail, including the under visor green satin, black cotton sweatband, dual branding and adjustable brown leather back strap. The jacket Classic baseball style Coaches jacket made from vintage rayon/cotton satin by the best in the business. Think the Wanderers if they were from the modern day North of England. This Thursday see's the release of the 16th collaborative shirt we've done with tuktuk. The 'Fresno'. We have produced a rather splendid checked flannel shirt. Containing a wonderful mix of colours, this one is a personal favourite to date! The 'Fresno' is inspired by classic Americana. Featuring a classic 2" button down collar, button top pocket with dual branded woven tab. Two large hand pockets at the hem. Box pleat and locket loop, finished off with genuine Mother of Pearl buttons and contrasting button thread detail. Made from 100% cotton. An excellent quality mid-heavyweight cotton fabric with a soft hand feel.